This is a very special recipe to me. Not because it is ground breakingly new, very clever or difficult. It is special because I feel like the mother of this dish. I had a hand in [almost] each component. Might sound silly, but all of you who have started on the continuum of gardening, stepped on the path of bread-making, entered into the world of bacterial fermentation, you will understand. "First we sow the seed, nature grows the seed and then we eat the seed." beetroot - grown in my small urban garden, harvested and put in the oven to roast within about 10 minutes. horseradish - grown in my small urban garden, pulled out, peeled and grated within about an hour. yoghurt - made the day before from the seed of a batch I have had for a long time. salt - from the South Island, but I do not know when harvested. pepper - indigenous to Java (not so far away), grown and harvested I do not know. Wash the beetroot, and trim the leaves making sure not to pierce the skin. Wrap loosely in foil and bake at 180°c for 45 minutes to an hour or until the beetroot is tender. Leave until cool enough to handle then peel off the skins. 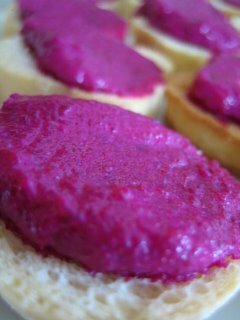 Put the beetroot through a mouli or blend. Peel and grate horseradish to your taste - the fresher, the less you will need ; jarred may be substituted if necessary. Stir in enough yoghurt to make the consistency required. Serve with crudités, create a canapé or spread on bread for wonderful hors d'oeuvre. I love beetroot dip. I must try your recipe. I just made this dip and it's just like what I found in Australia. I'm really happy that you posted this. Thank you! !